All of our switch kits come complete with switches and wiring harness. Our most popular switch kit! 4990-10-421 Electric Life Illuminated Joker switch kit. SK7-73FD Illuminated switch kit for 4 doors. Surface mounted switch panels. Electric Life Illuminated rocker switch kit. 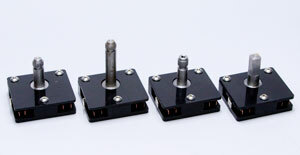 Switches can be mounted in supplied panels as displayed in top part of photo or they can be mounted without the panels as displayed in lower part of photo. Electric Life 2 door flush mount switch kit for center console or dash mounting. 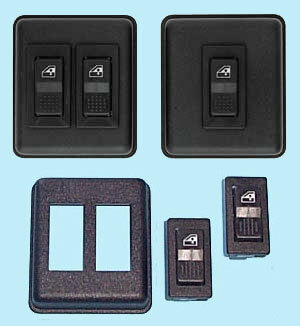 Electric Life 2 door flush mount switch kit with 3 switches. Comes with inline and side by side bezels for drivers door and a single for the passenger door. 4990-50-421 Electric Life 4 door Joker style switch kit. SK3-RGM 2 door chrome switch kits. Kits come with dual drivers switch and single passenger switch. 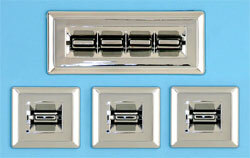 2 door chrome switch kit perfect for center console or dash mounting. SK7-RGM 4 window chrome switch kit. Comes with 4 way drivers switch and 3 single switches. Electric Life 2 door billet aluminum switch kit with 3 illuminated switches (door panel mount). Kit comes complete with aluminum faced switches, aluminum trim rings, back plates and wiring. Electric Life 2 door black billet aluminum switch kit with 3 illuminated switches (door panel mount). Kit comes complete with aluminum faced switches, black plastic trim rings and wiring. Electric Life 2 door billet aluminum switch kit with 2 illuminated switches for center console or dash mounting. 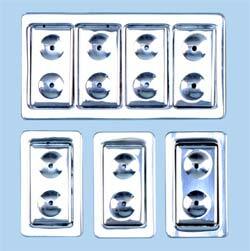 Kit comes complete with aluminum faced switches, aluminum trim rings, back plates and wiring. 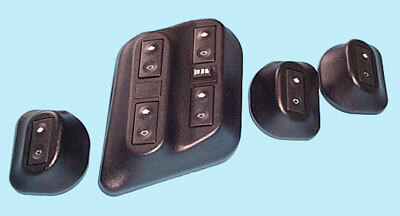 Electric Life 2 door black billet aluminum switch kit with 2 illuminated switches for center console or dash mounting. Kit comes complete with aluminum faced switches, black plastic trim rings and wiring. Use your window handles to activate your power windows. 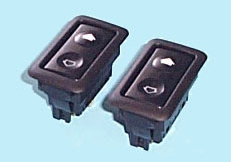 Electric Life 2 door flush mount switch kit with push/pull switches. 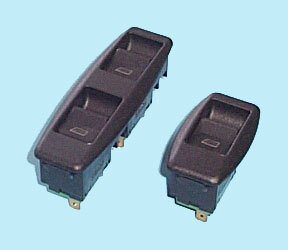 Switches can be mounted in armrest or door panel. Switch kit comes with bezel for inline mounting. 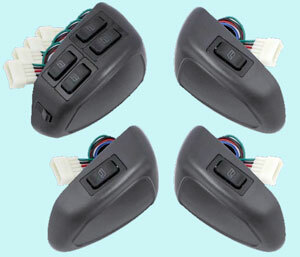 Electric Life 4 door power window switch kit. This kit can be used with or without the included spacers. Electric Life 4 window billet aluminum faced switch kit! 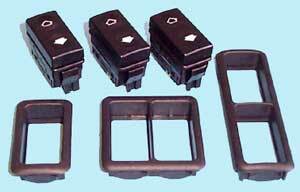 Has quad switch assembly for drivers door and 3 individual switches for passenger windows. flush mount power door lock switch kit for use with the A1 Electric/MES central door lock kits. Illuminated flush mount power door lock switch kit for use with A1 Electric/MES central door lock kits. Power door lock switch kit for use with A1 Electric/MES central door lock kits. Chrome door lock switch kit for use with the A1 Electric/MES central door lock kits.